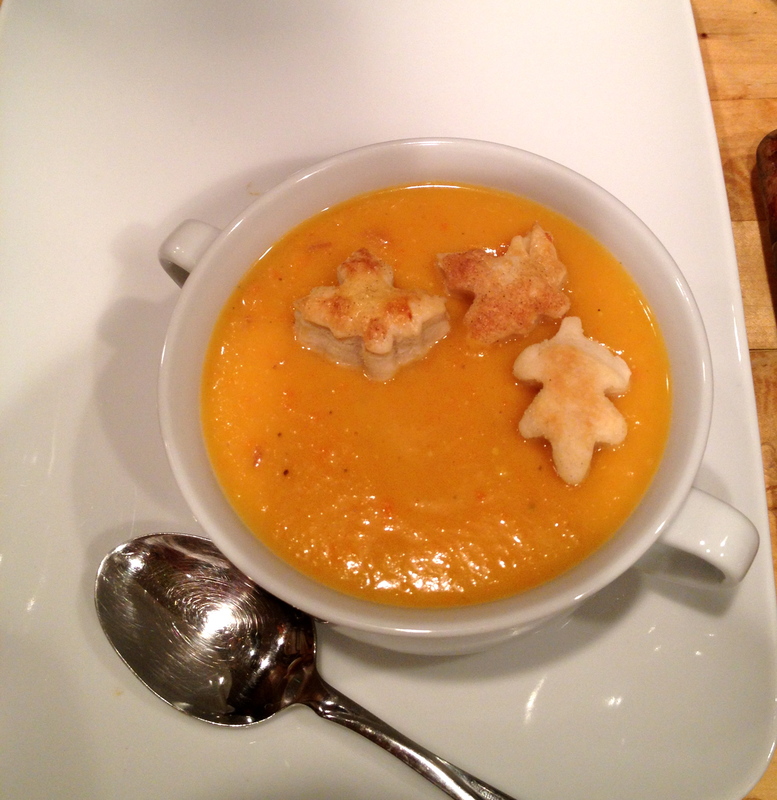 There are a lot of Butternut Squash Soup recipes going around right now but this one has a few different twists to it. It is a lighter version of most soup’s due to the Coconut milk instead of heavy cream, it’s a recipe from Kelly Osbourne‘s diet tips, yes Ozzie Osbourne‘s daughter,that’s where the Halloween part come’s in because Ozzie puts out a Halloween feel don’t you think( I mean biting heads off bats)? Plus nothing says “FALL” like Butternut Squash. She says she ate this a lot while she was loosing her weight. 1. In a large pot, heat oil to medium-low. Add garlic, onions and a pinch of salt, stirring until translucent, about 3 to 5 minutes. Makes six 1-cup servings. Each serving: 219 cal, 13 g fat. * I did not have coconut milk in a can, but I did have Cream of Coconut, so I mixed 1/2 cup with 1/2 cup evaporated milk. It probably made calories go out a bit but was very tasty and on the sweet side. I sprinkled my “Pie Crust Croutons” on top and served with a grilled cheese Sammie. 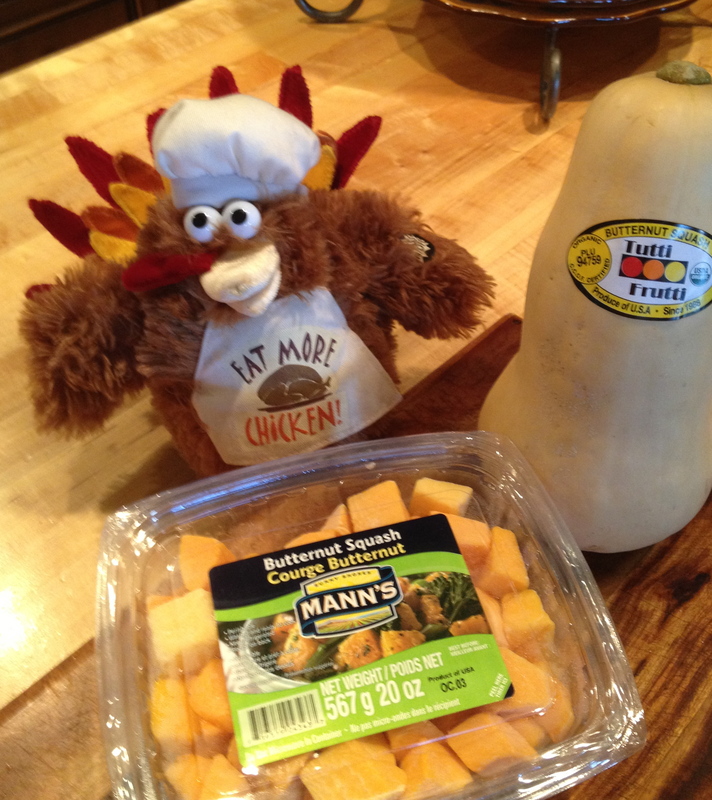 I used part pre-cut squash and part fresh just because that’s what I had. Buy fresh its just a little more work peeling and chopping but its cheaper and fresher. Always a better choice. My daughter Kelly and I both loved it and she says it’s a keeper and should be shared. This was so good! Even better because my mama made it, she is such a good cook!